A. Please use a harness. Because the Maltese is a very small dog of only 4-6 lbs his/her little neck won’t tolerate the slightest pull from a collar and leash without risk of injury. A harness is much safer. A. I’ve had good success with Revolution or Sentinel, applied monthly to prevents fleas, worms, and heartworm. It’s safe enough to used on small puppies. It may seem expensive, but because it is a broad spectrum solution, it’s actually less expensive than treating for heartworm, intestinal worms, and fleas separately. Q. Should I use a collar or a harness on my Maltese? Q. What do you recommend for flea protection? What about heartworm and worms? We like to feed all natural treats such as the PureBites. Pig Ears are greasy and will quickly make a mess of a perfectly clean, white Maltese face. Raw hide can cause intestinal blockage. We prefer ACHILLES TENDON for chewing. (click the links above), Achilles tendons break down into a floss as they dogs chew them. Chewing is important and relieves stress as well as helps prevent tooth decay. Please don’t leave your Maltese unsupervised with any kind of chew as he may choke. Q. What should I feed my Maltese? What kind of treats are acceptable. Can they have Raw Hide or Pig Ears? The first step in producing a ‘Super Puppy’ is selecting the parents. All characteristics are considered when choosing which Sire & Dam to pair for a breeding, with the hope of producing a dog with the best qualities of each parent, resulting in a better dog. We strive for diversity in bloodlines, which we believe to be important in producing puppies that are healthy. Health should always be the first priority. It is our belief that inbreeding and line-breeding should be kept to a minimum, or health and temperament suffer. Care of the Parents: Both the Sire & the Dam must have proper nutrition and care during their entire lives, not just during the breeding season. When a breeding occurs, the sperm released by the male was produced 60 days previous to the breeding. Therefore, if the dog was too hot, too cold, did not have good nutrition months before he was bred, had worm or flea infestation, or he was stressed in any way, he may not be able to produce good puppies. The female must receive good nutrition as well or birth defects mays occur and the condition of the Dam will suffer. Our girls receive prenatal vitamins during their entire breeding career, not just when they are pregnant. Delivering Puppies: It is imperative that a breeder have good whelping skills and can get a puppy out of the birth canal and breathing quickly, or have the good sense to get to the vet at the first sign of trouble, because any lack of oxygen can cause brain damage and result in puppies with learning disabilities. They must also latch on and nurse quickly so they do not become too lethargic & hypoglycemic, which again, can cause brain damage. Our mothers live in our laps and sleep with us during their pregnancy. They are never left alone once they are far enough along to deliver live puppies. They receive vet checkups, x-rays when needed, and are carefully monitored during their pregnancy, especially toward delivery. Every effort is made to assure they have no undue stress. Constant Supervision: Once the puppies have arrived and are breathing and nursing, it’s time to bond with their mother. At this time, the mother prefers to be left alone with her puppies as much as possible, so we have cameras installed that allow us to see and hear everything going on with mother and puppies while still allowing her maximum privacy. We are just steps away at any time mom or pups need us. Mom also needs extra nutrition at this time to help her recover from the stress of whelping puppies as well as extra calcium to help guard against ‘milk fever’ as her milk comes in. Sheets are changed daily to keep mom and puppies fresh and clean. Mom and pups are placed on a warming pad to help keep them warm. Puppies cannot regulate their own body temperature until they are 3 weeks old, but they can seek heat or move away from it if they are too warm. They will fade quickly if not kept warm enough. 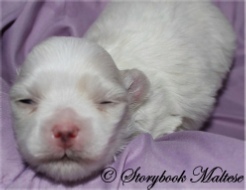 3 days old: Puppies are well established now, nursing well, bonded with mother, and recovered from the stress of being born. Now we begin the process of Early Neuro-Stimulation. Briefly put, these are exercises done with the puppies daily to help stimulate the neurological function & brain development of the rapidly growing puppies. Mother gets a bath to freshen up after the ordeal of whelping puppies. 2 weeks old: Eyes and ears are opening. The puppies are used to frequent visits from us. They will even lick my face when I hold them up close to me. 3 weeks old: The puppies begin to recognize me and they’re getting more and more mobile every day. They will begin to ‘play bite’ each other. Grooming practice begins. Every day each puppy is taken to the guest room for individual time with me. They are placed on their back on the bed and given a soft massage. They are combed all over and their feet are touched. A clipper is turned on and placed about a foot from the puppy so he/she can begin to learn that the noise from the clipper is associated with positive experiences. They get a little taste of Nutri-Cal when they’re all done. This becomes their first ‘reward’ for participating in the grooming training session and teaches them that good behavior brings tasty treats. It becomes very easy to teach and train a dog that will work for food. 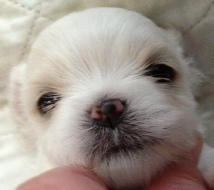 Puppies we hope to show get additional handling and training beginning at this age. 4 weeks old: The puppies look forward to their daily grooming time. By now, they are laying nicely on their backs, letting me clip their nails and shave the pads of their feet. Individual personalities begin to emerge. When I walk into their room they recognize my voice and run to greet me. The more social puppies will howl if I don’t get to them as quickly as they’d like me to. The puppies will seek out the potty pads their mother goes on to go potty. They begin to spend time in a pen in the living room to be desensitized to every day noises and get used to other dogs. They’re beginning to learn to drink water from the water bottles. The puppies get their 1st worming. 5 weeks old: Teething is underway and chews are provided. The puppies are beginning to show interest in food and we offer them food every morning. They’re also beginning to want to play ‘let’s shred the potty pad’ so paper pads are removed and cloth pads replace the paper pads. Our daily laundry doubles. 6 weeks old: The puppies get their first bath and take their first pictures. They also begin spending short amounts of time in their puppy purse and a purse is placed in the pen for them to explore and sleep in, if they choose. During the puppies ‘living room’ time, their pen is opened and they are allowed to roam and explore for short periods. They will naturally seek out the potty pads that our other dogs use, which are kept in close proximity. Mothers must be watched closely for mastitis now that puppies have sharp teeth emerging. The weaning process begins. 7 weeks old: The puppies are very playful now and eating more solid food every day. They’re teeth have broken through and they bite each other in play. Bite inhibition is learned at this stage and the puppies yelp when their littermates bite them too hard. They will also bite us. We use this time to help them learn not to use their sharp teeth on humans by ‘yelping’ when they bite us too hard. Obstacles are introduced. Puppies play in a ‘cat tube’ which is very noisy. They are provided with beds that are a little higher off the ground so they can learn that jumping off of things brings consequences and help develop depth perception. They spend a lot more time in the living room now and are loose to explore more and more. They will begin to nibble food from the common food dispenser in the living room and will drink water from the common water bottles. They’re getting better at using the potty pads with the adult dogs. 8 weeks old: The puppies are spending more time every day in their purse and getting a bath every week. Grooming practice moves from the bed in the guest room to a grooming table. The puppies can eat a small treat now to be rewarded for good behavior. Personality and characteristics are evident now. This is the time to evaluate puppies for show potential as their gate can be observed as well as their structure. Pigment should be in by now and coat quality is becoming a little more clear. The coat will go through changes and is most accurately evaluated between 6-9 months. Sharp teeth are in place and mother begins to wean the puppies. The puppies are eating well now but must be watched carefully for constipation or diarrhea as they complete the process of weaning. 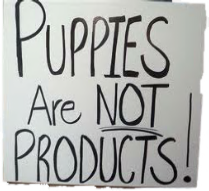 The puppies are taken to the vet for evaluation and any special concerns are evaluated and addressed. The puppies get their 2nd worming and their 1st shot. They have now entered the ‘fear stage’ and all care is taken to insure they have no negative experiences during this stage, which can affect them for life. 9 weeks old: The puppies should be used to their purses by now and potty training should be going well. They love to play and explore and chew. Chews are provided and they are encouraged toward what they can chew and discouraged from chewing what is not for them to chew. They enjoy time in our laps. 10 weeks old: Mother has usually completely weaned the puppies by now. They’re just about ready to go home to their new families where they will continue to learn and grow into wonderful members of the family. Is The Maltese Right For You? 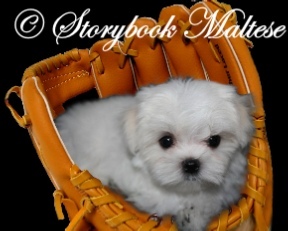 Are you grieving the loss of your Maltese? Not sure if you should get another? 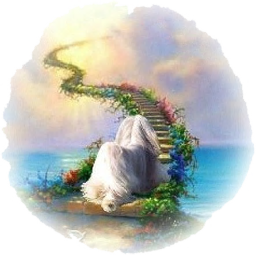 for information on grief & loss of a pet, and read stories from others who have been through this heart-wrenching loss.